ANother wonderful creation Sylvie...and you have just reminded me that I have this stamp tucked away somewhere! We could do with a bit of sun here as its very cold today, white over this morning...pretty to look at though. Gorgeous card, Sylvie. I have that stamp.....quite a long time actually. Did you know that it was designed by Kathy Mills of the Glitter Girls? I did giggle at how you cleaned your car!! I should bear that in mind when I look out of the window and see the rain again! 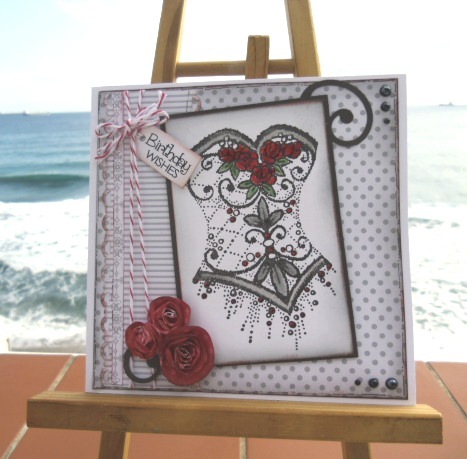 Beautifully elegant card, that image is so stylish and its reminded me again that I need to ink mine up! Lovely card Sylvie...I love the image, so elegant and stylish. Tee hee Sylvie .. .. and I have this stamp in my collection!!! Love how you have used it. The cute little tag and the roses are the perfect finishing touches. Beautiful card !!!!! Love the colours, think I've got this stamp somewhere deep in a draw, must dig it out now you've inspired me. When are you back in England, we'll have to catch up. Oh my word Sylvie this is quite beautiful that image is gorgeous and what wonderful colours and design this is superb.